The Socialist party ruling in France wants parliament to follow in the footsteps of Sweden and Britain and recognize a Palestinian state, an attempt to overcome a stalemate in peacemaking. Palestinians are seeking statehood in the Israeli-occupied West Bank and the Gaza Strip-territory Israel captured in a 1967 war, even though Israeli forces and residents withdrew from Gaza in 2005. After efforts failed once again in April to create a two-state solution, Palestinians see little choice but to push for unilateral statehood, and they have encouraged support from the international community. The Swedish government officially recognized Palestine’s statehood on Oct. 30, and the political climates of Spain and Ireland are leaning towards the same. The Israeli government told its Swedish ambassador that the country’s decision was counterproductive to the possibility of future negotiations. But Swedish officials said their government aimed to help moderate Palestinians by making their position in peace diplomacy more equal to that of Israel. A demonstrator shows support for Palestine. 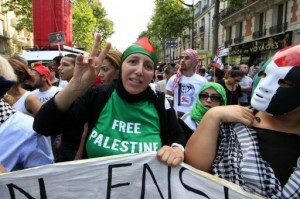 French Socialists said they think recognizing a Palestinian state will hasten the peace process.